We love to hear about your experience and see your photographs through the seasons. Don't forget to follow us on Facebook and share our pages. We know we've done a great job when you've had a fantastic day out! The following is a recipe for stewed duck. Half roast a duck, put it in a stew pan with a pint of beef gravy, a few leaves of sage and mint cut small and a small bit of onion. Shred as finely as possible. Simmer a quarter of an hour and skim clean; then add near a quart of green peas, cover close, and simmer near half an hour longer. Put in a piece of butter and a little flour and give it one boil, then serve in one dish. This is a very old recipe, from Mrs Bradshaw, Moorcroft, Macclesfield Road, Buxton. ‘Moorcroft,’ a large stone house in Macclesfield Road, just round the corner from Burlington Road was occupied for many years by Mr and Mrs Salt. Kath Salt was an indefatigable early fund raiser for the Buxton Civic Association for very many years including throughout the 1970s. 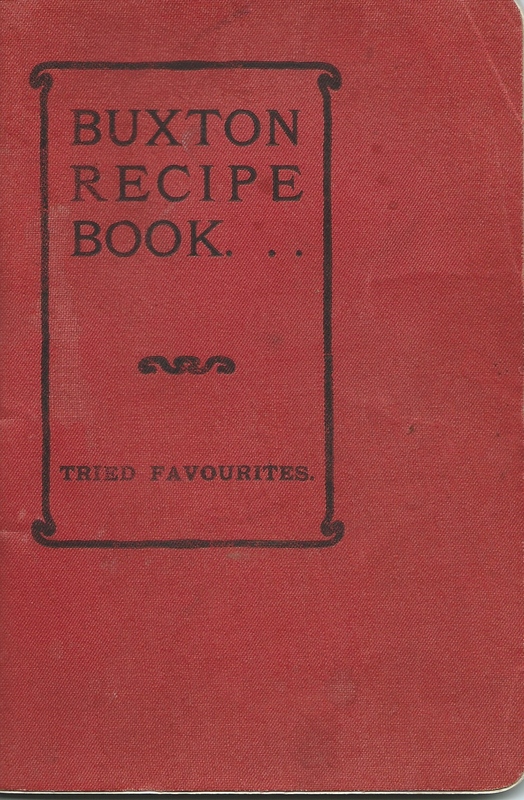 The second in our series of recipes from the past taken from 'The Buxton Recipe Book' published in 1912. Take a piece of the middle of a cod, boil it (not too much) in salted water and divide into flakes. With ½ pint of the water in which the fish was boiled, make rather a thick white sauce, using 2oz of butter to 1oz of flour with a grate of nutmeg and salt and pepper to taste. Butter and rub with a shallot a dish which will stand the heat of the oven; arrange on it a foundation of mashed potatoes. Make a layer of flakes of cod, mask with the sauce and add a grating of parmesan cheese. Make another layer of fish etc and strew lightly over the whole some w ell-dried bread crumbs. Put the dish in a brisk oven and serve directly the dish is a golden brown. This reipe was contributed by Mrs Brittain, Melrose, Park Road, Buxton. Make a note in your diary to have a look at the display of snowdrops in the front garden in February. This contributor must be Vera Brittain’s mother, close to the time her daughter was working at The Dome, formerly the Devonshire Royal Hospital – see Vera’s book, “Testament of Youth”. The recent discovery of a pre-First World War booklet contains not only fascinating advertisements from shops and businesses in the town, but also for many dishes of the time sent in by residents. Comprising savoury and sweet dishes as well as household remedies, it was discovered by the proprietors of the Lee Wood Hotel and made available to BCA. The booklet was printed in 1912 for the benefit of The Home of Rest Furnishing Fund, which was in West Street. Moreover, it contains the name of each contributor and the house name or road of where they lived. Should you yourself have any memories or information about the contributors mentioned or where they lived – or indeed a favourite recipe of your own – do let us know. It may be that we can make use of them in a future publication. The headings for each section are: SOUPS, FISH, ENTREES, MEAT, PUDDINGS, SWEETS, SAVOURIES, VARIOUS, INVALID COOKERY and MISCELLANEOUS. Here for your entertainment is the very last one! It takes us right back to the era of Donkey Stone, Rag and Bone Men, Dolly Blue and home-made starch. . . Mix a pennyworth of bath-brick, 2 ozs of dry soap powder, 2 tbspns of whitening well together, fill a tin with the mixture and punch some holes in the lid. Use for all greasy things. This quantity will last about a month and costs 3d. And here is the first recipe.We hope you enjoy making it. Take part of the liquid a fowl has been boiled in and add vegetables, a little onion, a tablespoon of pearl barley, 3 ½ oz of macaroni (well soaked), a little cornflour, pepper and salt. Boil all together, add a pint of new milk, and the remainder of the liquid; a little good stock can be added if necessary. Submitted by Miss M Burgess, Somersby, College Road, Buxton. Somersby is one of Parker & Unwin’s houses built in the Arts and Crafts style in 1895 – 96.